No 3 (C) in a series on Swindon’s sculptures. Yeah, I know, strictly speaking a statue rather than a sculpture but it’s close enough eh? And he has to be mentioned somewhere does old Isambard Kingdom Brunel – such an awesome name! – and he did rather put Swindon on the map I feel. I love that I live somewhere with such a heritage. I love that the Designer Outlet Village has retained much of the character of the old railway sheds and has pieces of engineering equipment dotted about and a train in the food court. It makes it really personal to Swindon. When shopping there I often think of the men and women that laboured so hard in the railway works. If you want to know more about Swindon’s very rich history and heritage there’s a great web portal which is home to 3 diverse but fascinating blogs covering aspects of Swindon’s history. Examining Brunel and the people and places who transformed the town is ‘Swindon in the Past Lane’. If wartime history is your area of interest then there’s ‘Swindon at War‘, while ‘Good Gentlewoman‘ takes a look at the lives of the St. John women of Lydiard House. Isambard Kingdom Brunel. Statue in Swindon. 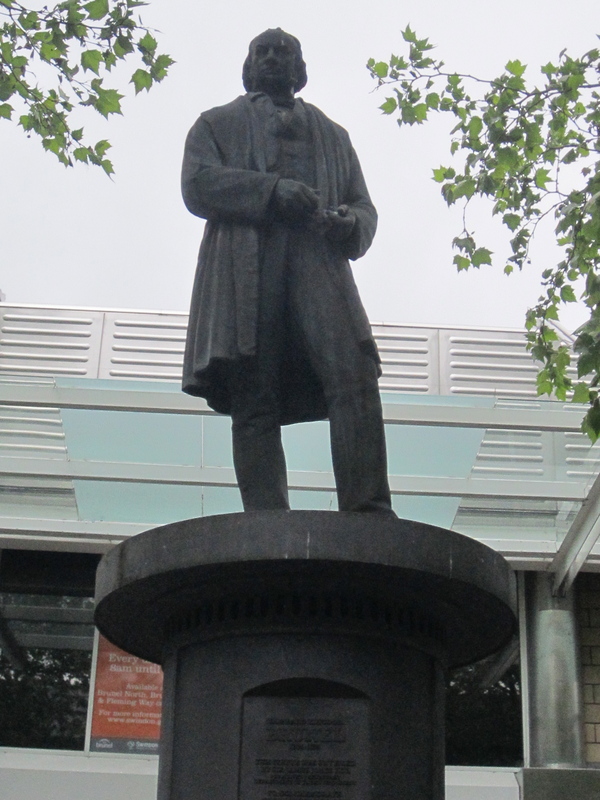 Anyway, returning to this statue of Brunel, without whom Swindon would arguably have remained a rural market town, is located close to the Brunel shopping precinct looking straight at Iceland; the frozen food store not the country. And thinking about it – is that the best location for him? Wouldn’t outside the station be more appropriate? Just a thought. As it says on the STEAM museum website: ‘The pioneering vision and engineering genius of Isambard Kingdom Brunel led to the Great Western Railway network becoming regarded as the most advanced in the world’. There’s a wealth of information on that there interweb for anyone wanting to know more about the founder of the new Swindon. Or even better hotfoot it to the STEAM museum in Swindon which is well worth a visit. I’ve been several times myself now and have always enjoyed it. The only blot now is that one can’t get to play with the signals for hordes of children. Pah! 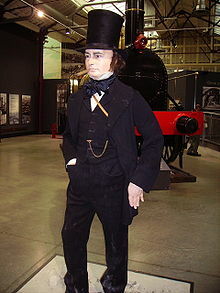 Wax sculpture of Brunel in Swindon’s Steam Railway museum. ‘Walk in the footsteps of Isambard Kingdom Brunel. Discover Swindon as it was when ‘Steam’ was the major invention that changed the way people travelled forever. In 1841 Brunel, one of the Greatest Britons of all time, and the Great Western Railway Company started to build what was to become one of the most outstanding industrial centres recognised around the world – the ‘Swindon Works’. Known locally as ‘The Works’ or ‘Inside’, in its heyday the GWR employed over 14,000 people and turned out over 60 new locomotives a year’. To my shame I didn’t know this trail existed, I only discovered it when looking up information about the STEAM museum to include in this blog. So as well as exhorting you lot out there to do it, I need to do the same thing sometime. Why not make a day of it? When you are ready for a spot of light refreshment you could try out some of the eating places I’ve written about on here. The town centre of course has its McDonald’s and numerous Wetherspoons – all of which are fine and dandy in their place and I visit them too – but if you fancy something authentic and different for a change then eschew them for once and give one or more of the ‘independents’ a try.